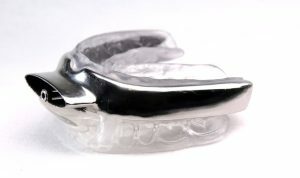 Australian medical device company, Oventus Medical Ltd. has announced that it will launch its first product in the USA after being granted clearance from the US Food and Drug Administration (FDA) for the O2Vent™ T device, an oral appliance intended to reduce or alleviate snoring, mild to moderate obstructive sleep apnoea (OSA) and sever sleep apnoea. The 3D printed titanium mandibular (jaw) advancement device has an airway that directs air to the back of the throat and bypasses nasal, soft palate obstructions and tongue obstructions, thus aiding the treatment of snoring and OSA. The O2Vent™ T was created by Brisbane dentist Dr Chris Hart, who founded Oventus and is the company’s Clinical Director. “The O2Vent™ T is the Company’s first product to be launched into the USA. Its FDA clearance is consequently an important milestone for us as we strive to bring our innovative product portfolio to the global market to benefit those that suffer from OSA or snore excessively,” said Oventus Managing Director and Chief Executive Officer, Neil Anderson, in a media release. “The recent clinical data strongly supports its superior performance and clearly demonstrates its effectiveness in treating a range of sleep disorders. It also improves oxygen levels for patients. It means a greater number of patients who are CPAP intolerant or mild to moderate sufferers of sleep apnoea now have an alternative treatment option available,” Dr Hart added. Check out the video below to see how this 3D printed device works.